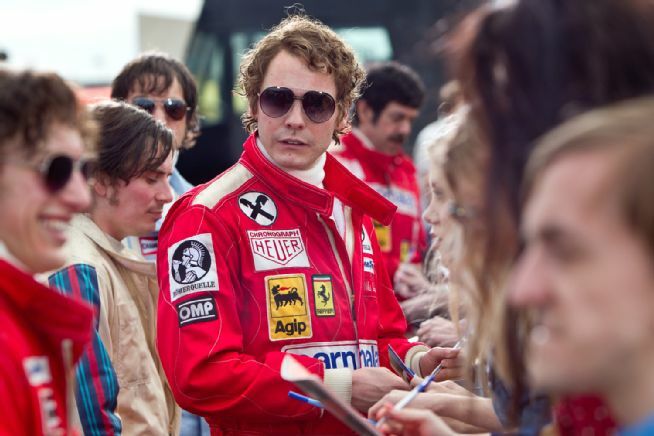 A considerable amount of races occur in Ron Howard’s “Rush,” a biographical sports film about the famous rivalry between Formula One drivers James Hunt and Niki Lauda. With so much story to tell in such little time, it is impressive what Ron Howard and his crew have managed to make of this sports fable. Peter Morgan has packed a lot into his script, documenting the rivalry from back when Hunt and Lauda were Formula Three drivers the the film’s final climax which takes place at the Japanese Grand Prix. Morgan has done his research down to the 70s dialogue, which is accompanied by a strong 70s design, courtesy of production designer Mark Digby. There are a few interactions between our two lead characters in the film. What starts as disdain matures into mutual respect for one another’s craft. The film also documents Niki Lauda’s horrific accident after working hard to maintain a lead in the run to the championship. With Ron Howard’s pristine direction, and collaboration of shot-design with cinematographer Anthony Dod Mantle, he is able to direct his film while keeping the final edit close to his mind. Every scene has its coverage, and once Daniel P. Hanley and Mike Hill start the edit everything is executed perfectly. Also with the help of an appropriately subdued score from Hans Zimmer. “Rush” is an extraordinarily well-paced film. It’s a film that knows when it needs to speed up and knows when it needs to take a breath. Peter Morgan’s script goes hand-and-hand with history and allows the audience to judge the characters accordingly, all while moralizing the infamous rivalry with a strong perspective on how people choose to live their lives: Short and on-the-edge or long and carefully. Chris Hemsworth and Daniel Bruhl lead a cast that doesn’t once overact. 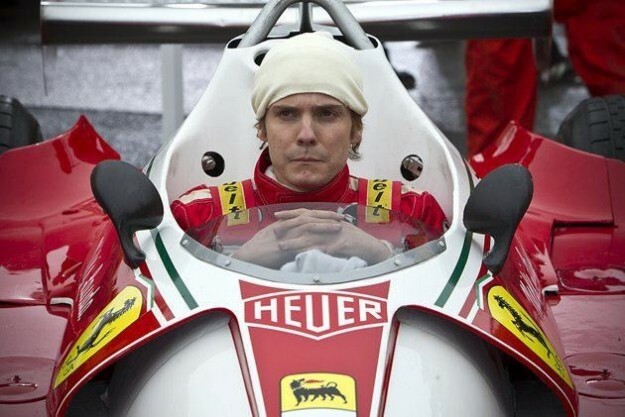 Daniel Bruhl’s Niki Lauda is a perfectionist, an intellectual social-outcast who wants nothing more than technical perfection. 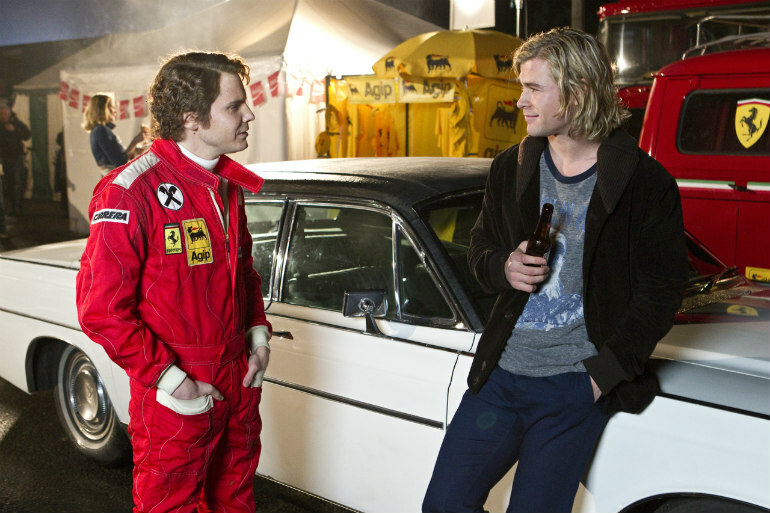 While Chris Hemsworth’s James Hunt is extroverted, filled with jealously by Lauda’s successes and guilt after his accident. The two, not only embody the original icons physically, but mentally and emotionally as well. I loved this movie. I easily consider it one of the best sports films I’ve seen, hell, maybe even the best sports film ever. It is consistently entertaining and constructed flawlessly. In a way the films construction coincides with the characters personalities, often moving fast with intermittent meditations. I’ve never watched a Formula One race in my life, yet I was engaged, not only in the races, but in the lives of these characters.